Last month, I found out that Aventura Mall is renovating the food court. (Actually, they're replacing it with a new wing that will include a new food court.) I know this is more local interest than anything else, but I'm posting it for two reasons. First, I want to see how easy it is to embed photos from Flickr. 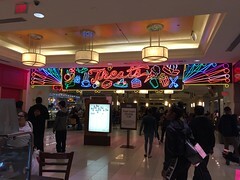 Second, the picture is of a sign that has been at the mall for as long as I've been going to that mall. I'm not sure what will become of the sign, so I wanted to share what might be one last photo of it. It's been there since they last renovated the food court. They may well keep it. I don't know. Anyway, here it is. It’s a big universe out there. Within our own galaxy, there are something like 200 billion stars. The number of galaxies in the universe could be of a similar magnitude. It’s hard to imagine that there’s no life orbiting one of those countless stars. Of course, as the Fermi Paradox points out, there should be some proof, or at least solid evidence, of alien life by now. Then again, the distance to the nearest star is four light years. Any civilization capable of traversing the vast space between stars could probably disguise themselves so that we would never know, unless something went horribly wrong. Such is the case with Starman. An alien crash lands on Earth. He makes it to a nearby house, where he finds Jenny Hayden. Existing only as a ball of light, he’s able to clone her dead husband and use the resulting body to interact with her. He sends a distress signal, then gets Jenny to help him to the rendezvous point for pickup. The body is temporary, so if he doesn’t make it, he dies. Add to this the fact that the U.S. military is after him. The two have to travel across the country from Chequamegon Bay, Wisconsin, to Meteor Crater near Winslow, Arizona. It’s not easy at first, since Starman’s knowledge of human languages is limited to what was onboard the Voyager 2 probe. (This is odd, though; he states that his people have been to Earth before. You‘d think someone would have written a phrase guide or something.) He eventually learns English and she eventually learns to trust him. It’s still not an easy journey. He does still have the government after him. I’d say for movies from the 1980s, this one held up pretty well. I think what stuck out most about the movie were two things: The simplicity of the story and the distinctive soundtrack. I remember a creative-writing professor saying that you could start and end your story however you felt best. The movie frames the story during Starman’s three-day visit. He meets a human woman who helps him, despite some setbacks and mistakes. We don’t need to go into all the details about humanity. Starman knows that we’re not perfect, but we’re worth studying.